Adam Sandler must be the hottest names of comedy genre lately in Hollywood, if not, remember his recently histrionic Zohan! The film is aimed at children. Saying that, it does not mean that the adults cannot enjoy it either. Being an Adam Sandler movie, expect more than a bit of craziness and extreme situations in the plot. But actually Sandler is quite measured in this one, maybe due to Disney being behind it, and not as irreverent and in many other of his productions. Actually, this can be a weakness of the movie, for Sandler’s fans, this is a “light” version of his skills. the secondary roles there are some really big names like Courteney Cox or Guy Pearce. Actually, I think that Pearce could do much better than appearing in these kinds of movies, but it seems that his career is on his way down after he gave us already 9 years ago that formidable gift of interpretation in my beloved Memento. Bedtime Stories is a movie to see in family, but well, do not expect tones of excitement with it, although it is worthy a couple of good laughs. 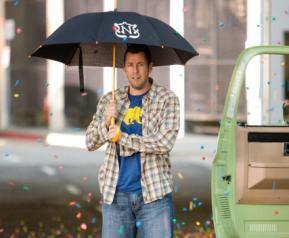 The best: Adam Sandler, he is the salt of the movie. The worst: in the end it is a product in between a Sandler’s typical comedy and a children’s film. The detail: Carmen Electra makes a cameo, as hot as ever!